$7.79 & FREE Shipping on orders over $59. 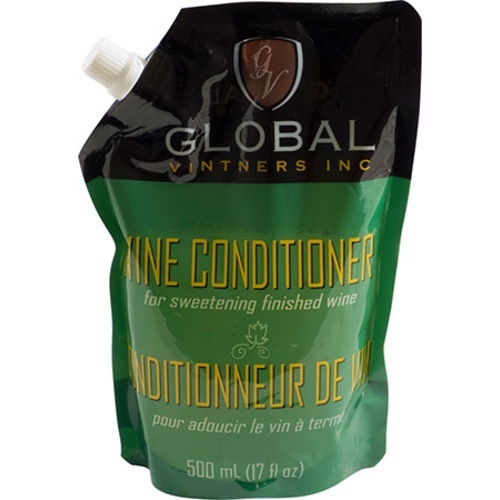 Wine Conditioner is a combination sugar/sorbate solution for adding to a fermented wine in order to give it some residual sweetness. The sorbate helps prevent fermentation of the sugar that you are adding. Solution is 76-78° Brix. Directions: Add to taste, usually up to 125ml (4 oz) per 23L (5 gal) of wine. Wine must be stabilized before adding sweetener. easy to use... need about 50ml per 20 bottles. Tastes like honey. Have 31 gallons of Cab Franc to bring the fruit out. It is totally awesome stuff. Great sweetener for wine making. Definitely recommend to those that prefer sweet wines. I made a rose wine for my mother in law. 5.5 gallons fermented dry. I finned, degassed and added the entire 500 mls to the 5.5 gallons. It has been maybe a month and all of the bottles are showing signs of fermentation and leaking. I thought this product would be perfect since it has sorbate already added but apparently I was wrong. I will not buy it again. I bought this to backsweeten my ciders. I was getting tired of the really dry ciders I had been making and wanted to try something different. Used this stuff entered the cider into a competition and got 2nd place. Pretty excited to give it another try and go for gold.